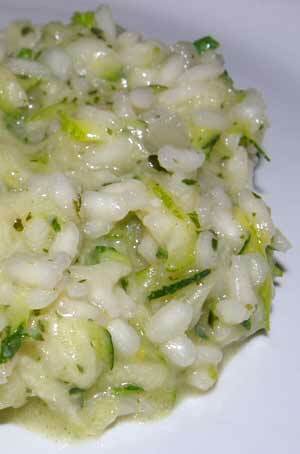 my ongoing efforts to use the courgettes we had regularly been given by friends-with-gardens, coupled with a long and tiring day requiring comforting cooking techniques and gentle flavours, led me to this courgette and lemon risotto. i’d heard various people talk about courgette risotto but mentally wrote it off assuming it would be too bland and really not worth the effort when there are so many other fabulous risotto variations floating around. however, given the ongoing courgette and lemon riff in my cooking this summer i decided to take the plunge. grate your courgettes, wrap the gratings in a clean tea-towel then squeeze out the excess liquid – you’ll be surprised how much comes out! if you skip this stage you risk ending up with a watery risotto. heat the oil and butter in a large pan, add the onion and cook until it softens. add the garlic and cook for another minute. add the rice and mix well so it becomes coated in the buttery oil. turn the heat up, add the white wine and stir while it bubbles away. add the vegetable stock a ladle at a time, stirring constantly and adding the next ladle when the rice absorbs the liquid. when you have used most of the stock, test the rice to see if it is cooked – you may need slightly more/less liquid. when it is ready add the courgette, lemon juice and zest, parmesan and basil. season to taste, cover and leave to rest for 5 minutes before serving.